The question “which central heating radiators are most efficient?” is not straight forward, as in this context the word “efficient” means different things to different customers. “Acting or producing effectively with a minimum of waste, expense, or unnecessary effort. It can be argued that all central heating radiators are equally efficient insofar as the energy put into a radiator will equal the amount of heat it gives out. In other words, all properly functioning radiators with same heat output capacity, will give out the same amount of heat as one another and will use the same amount of energy to do so. Its surface area determines the maximum heat output capacity of a radiator. The larger the surface area, the higher the potential heat output. Surface area will be greatly increased by convectors, fins, or double or triple panels. So for example, the heat output capacity of a flat single panel radiator will be considerably less than a radiator of the same size (height x width) with double panels, and/or convectors or fins. When considering one model of radiator, then generally, the bigger the radiator, the bigger the heat output. However this is not necessarily the case when comparing one model of radiator against another. In theory, the less water a radiator holds, the less time it takes to heat up, and the less fuel is would require to reach full temperature. Consequently, the lower the water content of a radiator, the more “efficient” it could be considered to be. However, in reality, there is little difference in the level of water content across radiator models, although over an entire system the slight variation would multiply. The shape of a radiator and its design does have an effect on the amount of heat it radiates, but again this is due to the particular surface area of the model. For example, a tubular radiator with hollow tubes offers a lot more surface area than a flat panel design without fins as the heat can be emitted from both the outside and the inside of the tubes. So the design of a radiator does have a direct effect on its maximum heat output. A radiator’s material of manufacture does not have a direct impact on the amount of heat it gives out. However, the material will be a determining factor in the speed in which the radiator heats up and cools down. For instance, aluminium heats up quickly and cools down quickly, whereas cast iron heats up at a slower rate and cools down at a slower rate. Science proves that the finish of a radiator affects its heat output in varying degrees. There is a principal known as “emissivity” that enables experts to measure the ability for heat to leave (or radiate from) the surface of an object. Levels of emissivity vary between finishes of radiators. Painted radiators have a higher level of emissivity than bare metal radiators, meaning that painted finishes absorb and release heat more than bare metal finishes. Matt finishes have a higher level of emissivity than gloss radiators. Even the colour of the finish can affect the level of emissivity. For instance, black paint has a higher level of emissivity than white paint. However, the difference in the emissivity of radiators is negligible and would only be realised in laboratory conditions. Only a chrome finish has a noticeable affect on the heat output of a radiator as chrome has a very low level of emissivity. The chrome coating works on the same principal as the space blankets (the silver insulation blankets) used to keep athletes warm. The chrome coating, whilst looking beautiful, does reduce the ability of the radiator to radiate heat. Chrome (chromium plated) radiators are proven to emit approximately 20% less heat than the equivalent sized radiators in a painted finish. In theory, the optimum radiator when looking for high heat output and rapid heat up time, taking all factors into account (no matter how minimal their impact) would be a matt black aluminium radiator with the greatest surface area for its size. In practice, there are many other aspects that will determine the best radiator(s) for your project, including, aesthetics, dimensions to fit your space, budget and availability. Your choice will be governed by which factors take priority. For more advice on choosing the right radiator(s) speak to a radiator specialist such as Feature Radiators. Contact their expert team directly on 01274 567789, meet them at their large West Yorkshire showroom, where they have over 160 radiators on display or visit their website. This entry was posted in General, Resources and tagged environment, home improvement, radiator, renovation on September 20, 2011 by Andy. The UK government said recently that households may receive up to £10,000 each to spend on “green” improvements, in an effort to encourage eco-friendly housing. Energy saving and cost effective additions such as double glazing, eco-friendly radiators and roof insulation will be promoted, as well as other forms of home improvement such as underfloor heating, draught proofing and water efficient tap systems. To qualify, householders must prove that their energy usage can save money, saving on bills in order to qualify for a share of the £10,000 sum. Anyone hoping to benefit from this should ensure that their boiler and radiators are up to scratch, and that they have ideas for further improvements. Ministers claim that the scheme could boost the economy by up to £2.5 billion and create up to 70,000 jobs. The initial costs are to be covered by retailers and utility providers, with the idea being that the home-owner repays the cost of the improvements over a 25-year period, with small additions to their utility bills. This entry was posted in News and tagged environment, home improvement, radiator on May 17, 2011 by Andy. What can we, as consumers, do in 2011 to reduce our energy consumption and minimise our carbon footprint whilst keeping our costs down and maintaining our home comforts? Domestic heating is a key area where we, as consumers, can all make costs savings and try to minimise our energy wastage as well as our utility bills. Below are some key tips for keeping your energy usage and consequently your heating bills down. Consider installing Thermostatic Radiator Valves. Thermostatic Radiator Valves, or TRVs, come with an in-built temperature sensor. A thermostatic valve will maintain a room at the temperature you have selected, by automatically adjusting the heat output from the radiator. This means that you can make the most of any “free” heat the room receives, such as that from the sun (solar heat gain) or from electrical or gas appliances. As the valve is controlled automatically, it adjusts itself, ensuring the radiators perform as efficiently as possible, reducing energy waste. For this reason, TRVs are the environmentally friendly valve choice as they prevent energy being wasted by overheating a room. There is now a wide range of stylish thermostatic valves available in both contemporary and traditional styles in a variety of finishes. For instance, Feature Radiators offers a wide range of TRVs on the valves page of their website. - For one pair of valves on a system, which can and should be manual, so they can be left fully open at all times. This is needed to allow the system to function properly. Usually such manual valves will be put on the radiator/towel rail in a bathroom or entranceway, as more constant heating is needed in these areas. - In rooms where there is a room thermostat that controls the boiler. Although not essential, TRVs are recommended for larger radiators (above 1800 watts, or where the radiator is oversized for the room) and for use in kitchens where temperatures tend to fluctuate dramatically (due to additional heat from ovens, fridges and other appliances). Ensure your central heating system or heaters are on timers. Timers are now available for gas central heating systems, electric radiators and electric central heating systems. This has been the standard for boiler systems for a while but now they are available on other forms of heating. For instance, iRad, the electric radiator from Feature Radiators, is available with a wireless controller enabling specific times and temperature modes to be set, minimising energy wastage. The importance of insulation in minimising wasted energy cannot be underestimated alongside the amount of money it can save on your utility bills. Improved insulation in your home is guaranteed to dramatically reduce the heat lost through your walls and roof, meaning less requirements for heating and resulting in lower energy usage. Look at the possibility of having cavity wall insulation and loft insulation installed. Many local councils now run schemes encouraging residents to go for better insulation by subsidising the cost, or even waiving the costs entirely. Also, better insulation means a lower heat output from your radiators is required. So if you are thinking of opting for new radiators, then more options are available, as the heat output will not need to be as high. For advice on choosing radiators with the right heat output for your situation, it is essential you speak to a radiator specialist or qualified heating engineer. Consider the future of your heating system. With stocks of gas and oil rapidly depleting, the future of the standard boilers is uncertain. A movement towards electricity as a cleaner fuel that can be generated from renewable sources is seeing the shift in the type of heating systems that may be installed over the next century. Heat pumps are very “in vogue”, but installation costs are high and many properties cannot accommodate or are not suitable this type of system. In order to retain your current central heating system and radiators, why not just switch to an electric boiler. These are currently available but at a relatively high price, but increasing demand is set to see the costs fall and this will provide a simple, practical and inexpensive option for many of us in the years to come. Other options for modern heating systems include electric central heating that is run by linking independent electric radiators wirelessly. Without pipework and a boiler, installation costs and disruption can be significantly reduced. This new electric radiator technology is really taking off due to its practicality, flexibility and efficiency. This may seem obvious, but the younger generation often seem to take central heating for granted, and wearing a T-shirt in the house despite sub zero temperatures is deemed quite acceptable by many. However, this is surely a waste of our precious resources and an unnecessary addition to our carbon footprint. Also what can be better than snuggling up under a cosy blanket on those frosty winter nights! This entry was posted in General and tagged environment, radiator on January 7, 2011 by Andy. Are you aware that 2 NYC based architects designed an asymmetrical home with fixed budget of $250,000? Architects and Jersey City citizens Richard Garber (assistant professor at NJ Institute of Technology’s College of Architecture and Design in Newark) and Nicole Robertson of GRO Architects in NYC rose to the challenge of constructing and overseeing the building of a single-family house that’s a genuine proof of both progressive design and environmental-friendly technology. Denis Carpenter not long ago purchased a compact vacant lot and, to achieve his concern for the environment, wanted a residence that was efficient and very easy to maintain. What's so particular about this home? - Inside the home, on the floor level, radiant heating below the exposed cement floor warms the full bathing room and two bedrooms. - In the attic-like 2nd level, sleek aluminum and stainless steel railings accent the bamboo stairway to the mezzanine, family room and an artfully designed kitchen made with restored devices and cabinetry. - Passive cooling strategies like ceiling fans and clerestory windows allow occupants to be cool during summer months and hot during winter. - The roof contains 260 feet square of photovoltaic panels that deliver around 2,000 kilowatts of energy per year to a battery stored in the basement. This single family 1,600-square-foot home was constructed in six months and won a 2009 American Institute of Architects merit award and the 2010 Green Building of the Year Award from the Jersey City Redevelopment Agency. Ok now what? How can you transform your home into an ecologically-friendly home without investing too much money? If you're remodeling a home, execute an energy review first to help you determine what energy efficiency improvements should and can be made to your home. In this way you'll calculate how much energy your home consumes. My favorite eco-friendly technique is the passive solar cooling/heating design. Passive solar signifies that your home's windows, walls, and floors can be created to collect, store, and distribute solar energy in the form of heat in the winter and reject solar heat in the summer. Existing buildings can be adapted or "retrofitted" to passively collect and store solar heat too. The Collector - The area through which sunlight enters the building (usually windows). The Absorber - The hard, darkened surface of the storage element. Sunlight hits the surface and is absorbed as heat. The Thermal Mass - The elements that retain or store the heat generated by sunlight below or behind the absorber surface. The Distributor - The method by which solar heat circulates from the collection and storage points to different areas of the house. The Controller - Roof overhangs can be used to shade the aperture area during summer season or Thermostats that signal a fan to turn on. The author - Cynthia Booth - shares knowledge for the architecture careers blog. It's a nonprofit web site dedicated to provide help for young architects who need resources for their careers. With this she would like to increase the attention on eco-friendly home design and change the general public conception of energy efficiency. This entry was posted in News and tagged eco-design, environment, home building, home improvement on September 14, 2010 by Andy. London based designer, Juyoung Kim, brings us Lasen, an energy saving lamp with a difference. When you wind the spiral spring, the light comes on, and when the spring runs down, the light will go off. As we all know, saving energy is today's hot topic, but just using less hardware, and subsequently power, is not the only way! This interactive light, inspired by a clock and manufactured in a combination of plastic and aluminium, evokes the user to perceive a sense of consuming electricity and hopefully prevent wasted energy. More details can be found at Juyoung Kim's website. This entry was posted in News and tagged environment, lighting on August 20, 2009 by Andy. Arup Associates has won the award for "Inspiring Design" for the Druk White Lotus School they have built in Ladakh Northern India. The award is granted by The British Council for School Environments. The project was instigated by HH The Dalai Lama as a model school in The Himalayas. It is a non-denominational school working from a wholly sustainable campus that has succeeded in making the best of new environmental technology and local skills. Arus Associates' focus is an approach to design that sustains all components of humanity: in essence, development that concerns itself with 'whole life' sustainability. They are not simply interested in reducing energy consumption. They believe the real issue is how human culture - tradition, religion, the intangible components of humanity - can be sustained in the face of modernity. They believe that it is essential for architects and engineers to work in ways that prioritize individuals, sustaining a sense of local identity both in terms of culture and the environment, through a reprioritization of the importance of human experience, including the senses and memory. The aim is a process of ‘whole life sustainability’ that places people first, and that enhances the existing value systems found within in different locations, rather than creating modernist models that expect people, cities and places around the world to behave in identical ways. In contrast to conventional ways of working, the Druk White Lotus project is founded in traditional values and cultures and yet at the same time seeks to advance educational needs in the context of the 21st century. The unusual collaborative approach defined by Arus Associates' strategy of unified design allows each of the advocates to find their voice, and allows seamless integration of the parts into the whole, without fear of inappropriate influence by an externally imposed architectural vision. The project is a model of sustainability: not only in the obvious sense, but more importantly, in the sense that traditional cultural values, spirituality and materials are maintained. The development naturally uses every available strategy to ensure a reduction of resource consumption. Yet the notion of ‘whole-life sustainability’, reaches far beyond issues of energy. Through the strategy of unified design, Arup Associates have demonstrated sensitivity to unique cultural and spiritual values, and have fostered them within a timeless design approach that respects and sustains their value indefinitely. His Holiness the Dalai Lama was moved by the outcome. “…The idea of having a modern school which lays equal emphasis on the importance of preserving the valuable aspects of a traditional culture is very encouraging,” he commented. “I have always believed in giving equal importance to both modern, scientific knowledge and traditional Buddhist Culture". This entry was posted in News and tagged architecture, design, environment on July 20, 2009 by Andy. 100 green apartments are to be built in Luton (United Kingdom) by the end of 2010 as part of Milieu Architects’ environmentally sustainable project. The apartments will use solar collectors and wind turbines, and will turn waste materials into energy to keep heating bills down to around £100 per year. It is all part of Milieu Architects’ ambitious plans for ‘Luton’s first environmentally responsible development’. The plan involves developing the derelict, recently crime-ridden, site on the northern side of Collingdon Street in Luton, and could spark an ‘urban renaissance’, according to businessman Jan Telensky whose company has proposed building the apartments. The scheme, formally known as ‘Low Energy Apartments (LEA) project’, is already receiving the support and co-operation of Luton Borough Council as it has been submitted to approach the planning stages, and Milieu Architects, which is made up of former University of Luton students, is confident that it will become a reality by the end of 2010. The idea of the innovative project is that it will provide environmentally sound housing and social facilities at an affordable cost and make a considerable contribution towards environmental sustainability, while enhancing the sense of community by regenerating the site into an attractive residential area. The building will be topped with visually attractive green roofs whose structural function is designed to protect the waterproofing layer from extreme temperature and abrasion, produce oxygen and reduce carbon dioxide production. Other key sustainable features include construction from thermal materials that store heat during warm months and release it during the colder months. This entry was posted in News and tagged design, environment, home building on July 16, 2009 by Andy. The Louisiana Museum of Modern Art in Denmark invited the Danish architecture firm 3XN to design a pavilion demonstrating cutting edge possibilities within sustainable and intelligent materials. The result is a pavilion that is built of bio composites with integrated intelligence that creates a dynamic interaction with its physical surroundings and its users. Everything about the pavilion is literally inspired by nature itself: The biological cycle of nature is the fundamental basis for the shape, the materials and the dynamic energy generation. The pavilion is shaped as a Moebius band to symbolize the biological cycle; and the properties of the construction are very like those of nature – for example, the pavilion has a coating of nanoparticles that helps clean the surfaces and clean the air. Additionally, the pavilion is built of biodegradable materials; and as for energy, the pavilion is 100 percent self-sufficient. Kim Herforth Nielsen, Principal of 3XN, comments on the project: "The Pavilion has given us the opportunity to showcase the possibilities which exist in building with sustainable and intelligent materials. Our objective has been to show that Green Architecture can be dynamic and active. We often think that we need to minimize use of resources at all costs. Instead of focusing on consuming the least amount of energy, we need to focus on producing and using energy and materials in a more intelligent way than is the case today." 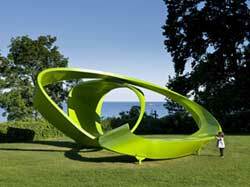 'Learning from Nature' can be seen at the Louisiana Museum of Modern Art, Denmark, until October 2009. This entry was posted in Events and tagged architecture, design, environment on June 29, 2009 by Andy.